DMZ is a label set up in 2004 run by producer/DJs Coki, Mala and Loefah (as well as MC Sgt. Pokes) out of Brixton, South London. 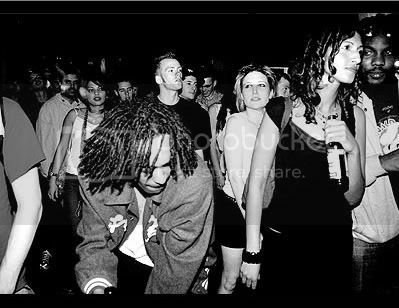 DMZ is also inarguably the most influential dubstep club night and part of the bedrock of the scene's origins. Coki and Mala are dubstep's most famous producers under their pseudonym Digital Mystikz, the DMZ label being a platform for their music as a duo, as solo artists or for longtime collaborator Loefah. They were present at the dubstep's beginnings in 2003 with producers such as Skream and Benga on the Tempa label, having a huge impact on it's direction with their incorporation of dub/reggae soundsystem aesthetics and values. DMZ's speaker set-up has a fierce reputation. Before the England smoking ban, the sight of glowing spliffs protruding from the raised hoods of skanking bass-junkies was a common sight; and many of dubstep's most recognizable names made the pilgrimage here throughout the first half of the Noughties to experience the infamous sound and 'meditate on bass weight'. Every budding 'scene' brings with it it's collection of pretentious arseholes and manifesto-writers and from what I've heard DMZ had it's share. But as the initial fervor of lost wanderers in virgin musical territory has diluted into hundreds of producers and releases every month, the DMZ dubs still take me back to the pure dread I cut my teeth on, sitting pressed to the wall of my flatmates room as he put the sub-woofer through it's paces practicing for the next set. A number of iconic DMZ tracks made it onto the Dubstep Allstars Vol.2 CD showcase on Tempa, which was largely responsible for popularizing the genre, and elsewhere, but here you will find just tracks from their 12'' back catalogue I have accumulated over the last couple of years. Except for the odd mid-bass one to break up the mood this is a sub-fest so, as always, make sure you can amp it up to hear everything. Last edited by Molecules; 03-15-2009 at 03:21 PM. I doubt they have them in the US so FYI Space Raiders are an ultra cheap snack, they cost 10p when I was a kid which I guess back then would have been twenty cents? i really like the way the chorus was incorporated, but ive grown tired of snoops rap style unfortunately . expirimentally speaking, i think that the two genres do sound very good together and would love to hear more of something else similar to this. i really think rap has gone stale and i think it could really use the exploration into more electro-heavy music, since they share a similar musical sound. Bit late with that mix but i'm downloading now. Chase and Status played at my uni, i was mashed and it was brilliant, every drum n' bass thing i've been to has been brilliant and i really need to start listening to it at home..
Boxcutter has a new record, anyone heard it? Anyone have more info on DatsiK? I heard several tracks of his and I'm really liking him.